Moles are a group of fur-bearing mammals that spend most of their lives burrowing under the ground. There are 7 kinds of moles. Featured here is the star-nosed mole. It ranges from northeastern Canada to Florida. The star-nosed mole has a 4 to 5 inch body covered with thick dark brown or black fur. Its scaly, hairy tail adds 3 more inches to its length. It has tiny eyes and tiny ears that are hidden in its fur. It has poor eyesight and hearing. Moles do not have a neck connected to its body. 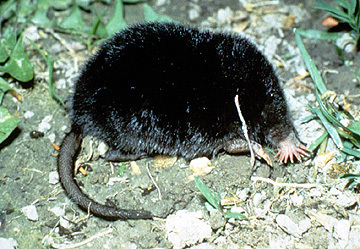 For the size of its body, the mole in this picture has large front feet. They are turned outward from its body. This feature allows the mole to use its feet as oars for moving through the water. With 5 claws on its front feet, this also allows the mole to dig and burrow tunnels while looking for food. If the soil is light, a mole can move through it at about one foot per minute! This mole has one other very strange feature. How do you think it got its name? Its nose is made up of 22 flesh-like tentacles. They allow the star-nosed mole to find food by feeling. They have a poor sense of smell. When digging or diving, the mole closes these tentacles over its nose to keep out the soil and water. It is the only mammal that has a nose shaped with small tentacles! During the winter, the moles select a partner and live together. They mate in late winter. The female finds a higher, dry place to build a nest out of grass and leaves. It takes the babies about 45 days to develop. One litter of 2 to 7 babies is born during the spring months between March and June. The newborns are helpless at birth. Within 3 weeks, they are ready to leave the nest. The number of years they live in the wild is not known. Most moles are located near low, swampy grounds near streams, ponds, and lakes. However, the star-nosed mole does not burrow as many tunnels as other moles do. Most of the star-nosed moles' tunnels lead to water. It spends most of its time diving and swimming for food. The star-nosed mole is active during all seasons. It has been seen swimming underneath the ice. Its tail grows fatter for the winter season. It is thought that extra energy and fat are stored in its tail. They spend little time above ground. For this reason, they avoid many predators. They are not an endangered animal. They do not come in conflict with human interests unless they are burrowing tunnels in a golf course! 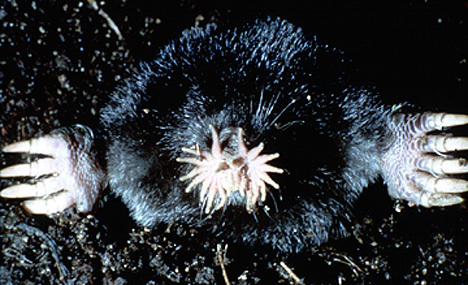 Star-nosed moles spend most of their time "feeling" for food. They eat earthworms above and below ground. However, most of their food is found in water. They eat water insects, crayfish, and small insects. They are considered to be carnivores, or meat eaters.